Welcome to June’s edition of the Positive Pet Training Blog Hop hosted by Cascadian Nomads, Dachshund Nola and myself. This month, we’re discussing our favorite trick. Mr. N’s favorites are probably either “high five” or “dance.” They’re his default if he is confused or mugging for a treat. He has also been offering “shame” a lot lately because that was the last thing we worked on so he assumes that’s what I want. As for my favorite… it’s probably whichever one I’m working on at the time! Right now, we’re working on unrolling a yoga mat and retrieving. The latter is frustrating me terribly because Mr. N is not a natural mouther. He will paw at the object in question or nose it but won’t offer any mouthing behavior. So we’re working on it with tiny baby steps. We’re on day three of working on it and he’s progressed from refusing to put his mouth anywhere near the stick to bringing it to me from four feet away. Mr. N seems incredulous that I just want him to bring back the stick. He’s like what if I hold the stick in my mouth and try to wave at the same time? Or if I hold the stick and cover my eyes? Oh fine. Have the stupid stick! And he’ll fling the stick at me. Yoga mat rolling is going rather smoothly. Initially, he wanted to roll it up rather than unroll it but it’s going in the right direction now. I think later on, I might try to have him unroll the mat then roll it back up. This video is from our first session. What’s your favorite trick? Does it differ from your dog’s favorite? Next month, we’re sharing our training triumphs, successes, ribbons, titles on July 7th but as always all posts about positive-based training are welcome. That was his choice! When he was on the mat, he kept trying to roll up the mat so I switched him to the other side. Lol. Mr. N is already working on variations on fetch as you can see above. Jack's not great at tricks. I've been trying to work on shake, but he tends to just lay down. With Maggie, I'm luck if she just pays attention – with a fearful dog like her there's only so much that you can do. Mr. N is so stinkin' cute. Chewy knows just a couple of tricks and will drop from Sit to Down in the blink of an eye. Works for me. Wow, that yoga-mat unrolling is impressive! Rita is not great at tricks either. (Okay… truthfully I'm not great at training her to do the tricks…) But she does a good "shake" and will then also offer the "other paw." We've been working on "roll over" but she's not keen! She's not super food motivated, so that doesn't help! Wow what a smart dog. Sniff from Laika and Vaks. I love the yoga mat trick! He is so cute, I can't even take it – what an adorable video! That's a pretty neat trick you're working on Snoopy! That is an awesome trick! Bahaha, the fetch thing made me laugh out loud. Petal thinks fetch is too boring. She'd rather play Keep Away or Tag. 😉 Love the yoga mat trick, so cute! Mr. N is so smart. The yoga mat trick is awesome and sure would come in handy here – pop over when you're done there Mr N.
He should start a service! LOL! I would love to teach Ruby to roll up my yoga matt after I use it because I always forget and then my cats scratch it up. Mr. N needs to come over and teach Ruby some tricks. He'd love to pop over and give some advice. Biggest challenge … what to do when your dog is absolutely not at all not even a little food driven. LOL I have managed to train little Montecristo using praise, hugs etc. but it has its limits. Maybe we will try again this winter as a way to fight cabin fever. Will he work for toys? Or for his food? He has to eat sometime.. This is so much fun to watch and I love that you're using the clicker for this. Do you do nightly session for a few minutes to train something like this? I don't train something new every day. Most days. But we usually do some kind of training every day. I liked this very much, who knows maybe our Feline Tribe of Five might be interested in the yoga trick! You should teach them to do it all at once! Thank you very much! I love training Mr. N. I'm glad it shows. The trick both I and Cookie love the most is the play bow. I was so excited when I managed to put that on cue. And I think she loves how excited that makes me. I like that trick too! Darn, no video on my phone. I'll have to check later. I trained service dogs at the beginning of my career, so lots of retrieving. Don't hesitate to try another object. I liked the pool things in the kid dr partment. They look like a stick except it's fabric with a soft but firm filling. Found at our dollar store. Keep up the good work. I think we had one at one point but they're huge lol! Mr. N learned how to retrieve in like a week or so. He's pretty good with most objects not although he's still not a fan of metal. Mr. N is such a talented dog and you're so good with him! A great team. Such a cutie and talented. Great video. Kilo likes shake a paw and will not return anything happily. He loves unrolling the yoga mat from the other side because I hide treats in it when I roll it up. No luck rolling it back up. How did you teach shame? I think I used a bit of tape and rewarded him for the scratching motion. I had to convince him that I wanted him to scratch it. I think he thought it was some kind of weird photo prop. That's pretty cute, Mr. N. I'm learning to do tricks, too. Mr N is so cute!! I wish I could get my big pups to "dance" but they know they are not suppose to jump….and i just cant get them past that and dance on their back legs (which they are not very strong in) which is why i think teaching them to "unroll" a mat like you are Mr. N i think that would be a great workout for the back legs!! So smart! Yeah, different tricks are easier for different dogs! There are some that are hard for him because of size. Cool! Mr. N has a busy brain so we try to give him things to do. Patience is definitely required. He is so darling – and clever! Reese loves fetch but will rarely bring the ball right to me. Mr. N plays fetch very sporadically. So I had to train this from scratch. Yay for Mr. N! I want to teach Simba some more tricks soon. I think my fav that he knows is when he gives the kids a five. That has been very popular here. I love Mr. N's high five trick. 🙂 He is so cute. It looks like he is doing a great job learning to unroll the yoga mat. He likes doing it. Maybe he thinks he's helping! Bravo, Mr.N! Unrolling a yoga mat is so wonderful! May I borrow you?! My FiveSibes favorite trick… Gibson's was saying "I love you" and "Give me Gibbie kiss," Harley and Wolf is giving paw, Chloe and Bandit is "sit!" I love this post! Haha. I should rent him out to yoga studios. I think Layla would have fun learning tricks too! Mr N is a talented dog. Maybe he's a bit like our mom – she is a slow learner BUT she never ever forgets ANYTHING she learns. Maybe he could come for a holiday to NZ and roll up beach towels 🙂 He's such a star!!! Retrieving is a bit of a complicated trick especially for dogs who are not inclined to do it at all naturally. He learned it in a week or so. Mr. N is so cute and so eager to please! I love watching him! How much time a day do you spend training? I know it is a wonderful bonding experience for both of you. Walks usually have a good amount of training sprinkled in as he's reactive to dogs and we live in dog nirvana. We probably spend maybe ten minutes a day or so rehearsing old tricks throughout the day (while waiting for dinner etc) and I train new things at least several times a week for about five minutes at a time. Gosh, I felt like I was reading about Finn! He's at pretty much the same stage & enthusiasm for each of the trick you mention… Except Dance, he only knows the dinner dance! Haha. Mr. N loves "dance!" Dex has a few tricks he does. He is a pro at roll over and thanks to training him at home, we passed CGC title on the first attempt. Fun stuff! Great job, Mr. N! We're impressed! 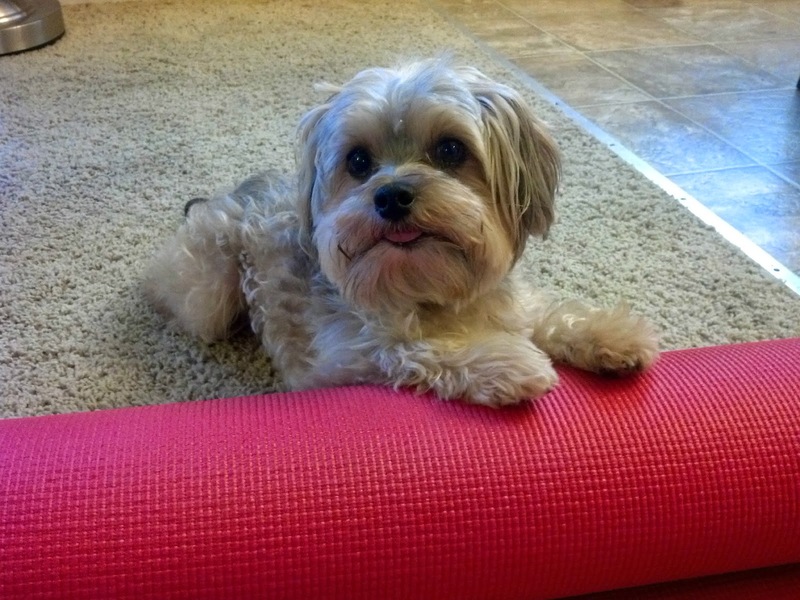 I didn't realize such a small dog could work the yoga mat, great job! Matilda does her curtsey a lot now, and loves to retrieve her toys – I just turned her retrieve into "put it away" so now she helps clean up! Well they're not that heavy, just bulky. Mr. N knows how to clean up too! Well how smart is that, woohoo!